Shunya Saito, 17, doesn’t think about the Constitution or politics. In fact, none of his classmates at Funabashi Kita High School in Chiba Prefecture picked constitutional revision from the 50 topics provided for a recent debate class. Although the new voting age of 18 will allow him to vote in what is shaping up to be one of Japan’s most pivotal elections ever, Saito and his peers say the most pressing issue now is motorcycles, and why they are banned from using them to go to school if they can get a driver’s license at age 16. Japan’s postwar charter took effect on May 3, 1947, and Constitution Day on Tuesday will be marked by various events. But a vast majority of the nation’s youths are likely to relate to Saito’s feelings even though 2.4 million 18- and 19-year-olds will get their first chance to vote in the Upper House election this July, where the Constitution might be one of the main issues. In the near future, they might also be asked to directly make a decision about constitutional revision, Prime Minister Shinzo Abe’s ultimate goal, because the voting age for national referendums on amending the supreme code will also be lowered to 18 in two years. Abe’s Liberal Democratic Party in 2012 adopted a draft constitution that advocates the setting up of a “national defense military,” curtailing civil liberties and prioritizing public order over individual rights. “I think the LDP draft constitution is very dangerous,” said Shunichiro Kobayashi, a 19-year old student at Tsuru Bunka University in Yamanashi Prefecture, who said the current Constitution should be protected because the draft has problems with regard to human rights and the military. Kobayashi is a member of SEALDs, or the Student Emergency Action for Liberal Democracy-s, which rocketed to fame when it organized mass protests over the contentious security bills the Abe administration pushed through the Diet. Not all youths, however, are as politically active and aware as Kobayashi. Many are more likely to relate to Saito’s lack of knowledge about Japan’s supreme law and the political debates around it because they don’t engage in political debates in school. According to a poll by the liberal-leaning Asahi Shimbun in April, 62 percent of 3,000 youths aged 18 and 19 said they either do not or rarely talk about politics. Unlike the United States or the United Kingdom, where education is promoted and students freely discuss social and political issues, political debate is virtually nonexistent in Japanese classrooms. Article 14 of the Basic Education Act stipulates that schools should “refrain from political education or other political activities for or against any specific party.” That means many teachers impose self-censorship, discussing only the nuts and bolts of political system, and steer well clear of the LDP’s thorny draft constitution. The odd relationship between politics and education came to light in March when the Ehime Prefectural Board of Education decided to require advance notice from students who intend to attend off-campus political activities. Last year, during Diet deliberations on the security bills, an LDP member of the Yamaguchi Prefectural Assembly criticized a high school debate about the security bills as politically biased. Later, the education board apologized for what it called a lack of political neutrality, even though the students only debated and voted on their views of the bills, which became law. Fuyuki Jo, a social studies teacher at Funabashi Kita High School, said his students often feel they are not allowed to express their views on politics or the Constitution. “They have this ‘weird conscience’ that they should not have a say about the Constitution when they do not know about it,” said Jo, who has been holding debate classes for 27 years. “This creates a vicious cycle that makes students think these issues are from other planets,” he said. One student in his class, however, honestly expressed his fear of being drafted into the military if the Constitution is changed and Japan finds itself at war. 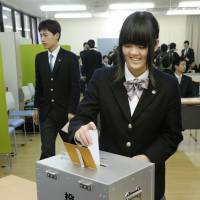 But Aoi Momose, 18, head of the student group Teen’s Rights Movement, said Japan should have greater military capability to protect itself from attack. “I don’t think it’s thanks to Article 9 that we’ve been able to stay clear of war” for the past 70 years, Momose said, adding that Japan’s postwar peace was largely due to the Japan-U.S. alliance and America’s extended deterrence. Nishida of Tokyo Institute of Technology attributed this polarization among youths to their tendency to gather information through people they closely follow on social media. This allows them to automatically eliminate views that differ from their own. In the meantime, student-led organizations are becoming the main political educators in Japan. The nonprofit organization Bokura no Ippo ga Nihon wo Kaeru, which roughly translates as “our one step changes Japan,” has been spearheading voter education since last year. The NPO dispatches youths to municipalities so they can learn about local issues and set up their own mock elections based on what they learn from the community. Yet Hirokatsu Goto, 21, the Chuo University student in Tokyo who leads the organization, said students rarely pick the Constitution as a topic for a mock election. He said few young voters can find a role model among older lawmakers who support or oppose revision. Under the current system, a candidate for the House of Representatives must be at least 25 years old, and one for the House of Councilors must be at least 30. But the average age is 55 in the Lower House and 57 in the Upper House. “I think younger people should think of the Constitution as their own issue, and I feel threatened that they don’t,” said Goto, whose dream is to become a politician.